‘Whatchuwhoooooant? !’, topped with a spoken word with lyrics inspired by people with insecurities who act irresponsibly. Subtle jazz fused licks bubble over a bouncing groove on ‘Drama Untied’ with a vocal sample that calls upon all of us to recognise ourselves as one. ‘The Cheerleader’ comes armed with a dose of funk, with a popping bass hook and a vocal message. “This track is about my growth to blaze my own trail, the lyric - ‘No more shines’ - is a really a profound statement to either follow realness or get out of the way,” says Demuir. Demuir's DJ and production career has propelled him into a range of various house based genres (jacking / funky house, techno, tech-house), which has led to his music being featured on many labels including: Great Lakes Audio (GLA), IAHG (I Am A House Gangster), DNH, Fogbank, Farris Wheel and Doin' Work, among many. He even extends broadly and dabbles in hip hop and samba as an extension of his musicianship, playing a wide range of live instruments as well. He tracks have had plays from DJs including Mark Farina, Derrick Carter, Nick Holder, DJ Sneak, Doc Martin, J. Paul Getto and Darius Syrossian and he continues to broadening his presence as a DJ and producer, gaining respect for his funky, soulful house sounds, with his latest EP, ‘Closer 2 U’, on Mark Farina's Great Lakes Audio label. 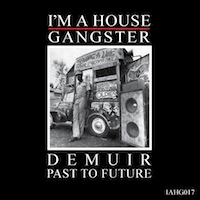 Demuir 'Past To Future EP’' will be released on 16 March.